For the past several months I’ve been calling SSDs the single most noticeable upgrade you can do to your computer. Whether desktop or laptop, stick a good SSD in there and you’ll notice the difference. I’m always angered by the demos in any Steve Jobs keynote. Not because the demos themselves are somehow bad, but because Jobs always has a perfectly clean machine to run the demos on - and multiple machines at that. Anyone who has built a computer before knows the glory of a freshly installed system; everything just pops up on your screen. Applications, windows, everything - the system is just snappy. Of course once you start installing more applications and have more things running in the background, your system stops being so snappy and you tend to just be thankful when it doesn’t crash. A big part of the problem is that once you have more installed on your system, there are more applications sending read/write requests to your IO subsystem. While our CPUs and GPUs thrive on being fed massive amounts of data in parallel, our hard drives aren’t so appreciative of our multitasking demands. And this is where SSDs truly shine. Before we go too far down the rabbit hole I want to share a few numbers with you. This is Western Digital’s VelociRaptor. It’s a 300GB drive that spins its platters at 10,000RPM and is widely considered the world’s fastest consumer desktop hard drive. The 300GB VelociRaptor costs about $0.77 per GB. This is the Intel X25-M. 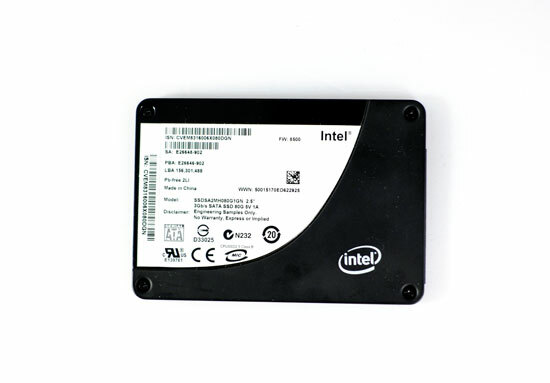 The Conroe of the SSD world, the drive I reviewed last year. It costs about $4.29 per GB; that’s over 5x the VelociRaptor’s cost per GB. The VelociRaptor is the dominant force in the consumer HDD industry and the X25-M is the svelte bullfighter of the SSD world. Whenever anyone mentions a more affordable SSD you always get several detractors saying that you could easily buy 2 VelociRaptors for the same price. Allow me to show you one table that should change your opinion. This is the Average Read Access test from Lavalys’ Everest Disk benchmark. The test simply writes a bunch of files at random places on the disk and measures how long it takes to access the files. Measuring random access is very important because that’s what generally happens when you go to run an application while doing other things on your computer. It’s random access that feels the slowest on your machine. The world’s fastest consumer desktop hard drive, Western Digital’s 300GB VelociRaptor can access a random file somewhere on its platters in about 6.83ms; that’s pretty quick. Most hard drives will take closer to 8 or 9ms in this test. The Intel X25-M however? 0.11ms. 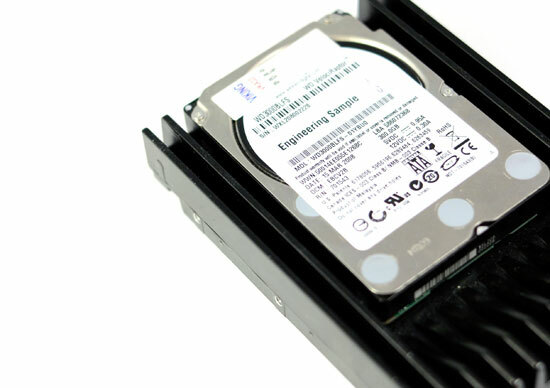 The fastest SSDs can find the data you’re looking for in around 0.1ms. That’s an order of magnitude faster than the fastest hard drive on the market today. The table is even more impressive when you realize that wherever the data is on your SSD, the read (and write) latency is the same. While HDDs are fastest when the data you want is in the vicinity of the read/write heads, all parts of a SSD are accessed the same way. If you want 4KB of data, regardless of where it is, you’ll get to it at the same speed from a SSD. The table below looks at sequential read, sequential write and random write performance of these two kings of their respective castles. The speeds are in MB/s. If you’re curious, these numbers are best case scenario for the VelociRaptor and worst case scenario for the X25-M (I’ll explain what that means later in the article). While the VelociRaptor is faster in the large block sequential writes look at the sequential read and random write performance. The X25-M destroys the VelociRaptor in sequential reads and is an order of magnitude greater in random write performance. If you’re curious, it’s the random write performance that you’re most likely to notice and that’s where a good SSD can really shine; you write 4KB files far more often than you do 2MB files while using your machine. If the table above doesn’t convince you, let me share one more datapoint with you. Ever play World of Warcraft? What we’re looking at here is the amount of time it takes to get from the character selection screen into a realm with everything loaded. This is on a fully configured system with around 70GB of applications and data as well as real time anti-virus scanning going on in the background on every accessed file. The world’s fastest hard drive gets us into the game in 12.5 seconds. The Intel X25-M does it in under 5. SSDs make Vista usable. It doesn’t matter how much background crunching the OS is doing, every application and game launches as if it were the only thing running on the machine. Everything launches quickly. Much faster than on a conventional hard drive. If you have the ability, try using your system with a SSD for a day then go back to your old hard drive; if that test doesn’t convince you, nothing will. That’s just a small taste of why you’d want an SSD, now let’s get back to finding a good one.